Surprising as it may seem there is in fact a connection between the famous composer Tchaikovsky and Tyrannosaurus Rex, well there is for me at least in respect of links to my poetry! Firstly, among the great works of Tchaikovsky is the wonderful music composed for the ballet Swan Lake, which just so happens to be the title of one of my pictopoems. 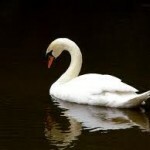 Although my poem has nothing to do with ballet it was perhaps the grace and beauty of the ballet that prompted me to pick the title Swan Lake because I have always been fascinated by the graceful beauty of swans, which is what my poem is about. 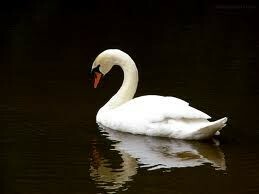 And swans have feathers which brings me to the next link; feather boas. Yes I know feather boas are not made of feathers from swans but they are feathery nonetheless and I just so happen to have one in pink. 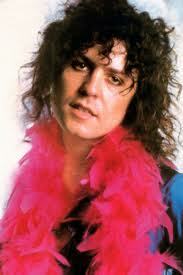 And thinking of my pink feather boa makes me think of Marc Bolan who was pictured wearing one such colourful accessory in his heyday. The sadly departed very talented Marc Bolan was of course the flamboyant frontman of the band T.Rex that had a string of hits in the 70’s including Ride a White Swan. Ahha we have reached the final link you might think. Well no not quite. The last link in the chain is the fact that my favourite track by Marc Bolan is Debora, an early production from when his band was called Tyrannosaurus Rex. But going back to the swan theme, here is a rather unusual performance by Marc Bolan singing the Ride a White Swan song from the back of a rather peculiar pantomime-like prop of a swan!